The Passivhaus Trust is an independent, not-for-profit organisation, and is a subsidiary of the AECB. The Trust has an inclusive governance structure that includes all relevant parts of the Passivhaus process and supply chain as well as independent experts, academics, buildings related charities and not-for-profit organisations. 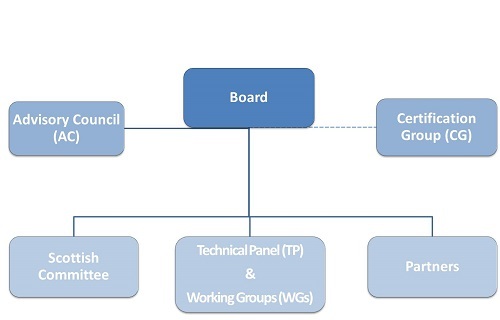 The Board is made up of members of the AECB, representatives from the Partners, the Technical Panel and the Scotland Committee, along with other invited individuals covering the full range of organisations involved in the design, delivery and certification of Passivhaus Buildings. A number of experts have been invited by the Passivhaus Trust to advise on detailed technical issues pertaining to the application and delivery of Passivhaus in the UK. The Technical Panel, which is held annually, will explore these issues under defined topics in various Technical Working Groups. Current topics can be found here under research and guidance. The Passivhaus Trust was founded in the UK by the AECB and is affiliated with the International Passive House Association (iPHA) – an initiative of the Passivhaus Institut and Dr Wolfgang Feist.